The cute bunny rabbit pictures that you see in the gallery on this page would be a perfect fit for a Peter Rabbit, Beatrix Potter, Bugs Bunny and many other baby nursery or kids' room themes. The bunny pictures on display were hand picked specifically for that purpose. Once the nursery walls have been painted and the rest of the room has been arranged, it's time to choose the bunny wall art so let's get started! There's nothing sweeter than a picture of a baby rabbit snuggled with his mother. A picture of a white rabbit complete with pink eyes with a wide pink ribbon tied in a fluffy bow around its neck would be lovely in a feminine nursery for a baby girl and our old friend from the cartoons, Bugs Bunny, would be cute as can be for a baby boy's nursery. A Bugs Bunny picture on a vintage style poster won't exactly work when a frilly room with toile, but it will look fabulous in a funky retro styled room. Save the colorful cartoon pictures to use on the walls of a modern theme room. For classic bunny themed rooms there are some wonderful bunny rabbit nursery chandeliers that will work beautifully with classic framed bunny art prints. Prints made from old master's oil paintings suit English garden or in some instances, French country styles of decorating. It's not hard to carry your bunny theme around your baby's bedroom with the careful placement of your beautfully framed and matted bunny rabbit pictures. There are luxury bunny baby bedding sets, elegant round baby beds with rabbit or carrot crib finials and other nursery accessories that will tickle you and your baby! 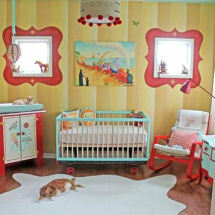 If you are using a traditional crib, dress it up with the use of a crib canopy in coordinating bunny print fabrics. If you are lucky enough to have an antique wooden cradle or baby bed, dress it up for show even if baby doesn't sleep there. There are many patterns for decorative cornice boards that could be adapted for use in making a crown capable of holding canopies over a baby's bed! If you have some leftover wooden molding, you have a great start for a do it yourself craft project that will raise your nursery decor to a custom designed look! Or those leftover pieces of wood can be crafted into matching frames for some of your bunny rabbit pictures! 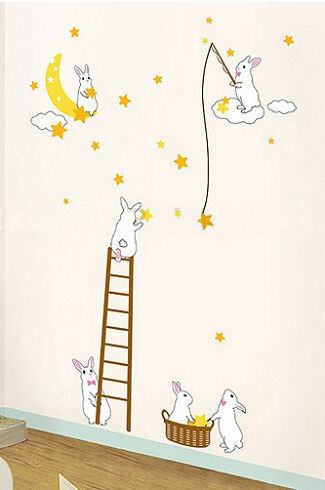 For a baby boy's nursery, the bunny prints can display a funny, brown bunny and his happy little friends busy with all of their storybook fantasy activities. Peter Cottontail and his friends are the main subjects of many cute bunny rabbit pictures taken directly from the pages of the storybooks. Stencil some little bunny paw prints in a trail across the nursery floor. 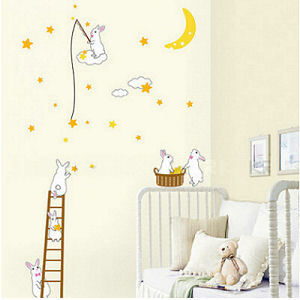 For additional wall decoration, continue your stenciling across the wall to show baby exactly which path the bunny prints in your house take on any given day. On an opposite wall, a plate rack with some collectible Peter Rabbit plates would work very nicely. The bunny rabbit pictures don't have to be of real bunnies after all. You can have framed bunny prints of cartoon characters like Roger or Jessica Rabbit if you happen to have a collection of pictures from the movie Who Framed Roger Rabbit! Roger Rabbit pictures are lively, colorful and very collectible. Other possibilities would be real pictures of bunny rabbits in their natural habitat, rustic folk art paintings or drawings of other famous cartoon characters like Bugs Bunny. Around Easter, an arrangement of cute pictures of the Easter Bunny would be a fun way to decorate a kid's room. The colors in many bunny art prints are soft and subdued which set a relaxing tone in the room where they are displayed on the walls. Here are some excellent examples of bunny pictures and prints in this style for your Nut Brown Hare nursery or the Beatrix Potter Nursery. There are even a few posters for a Looney Tunes or Bugs Bunny Nursery Theme! Please make plans to visit us again soon to see more bunny rabbit pictures and baby nursery ideas.